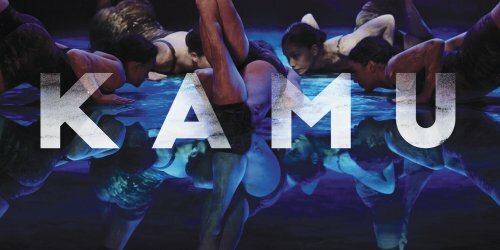 NAISDA: The National Aboriginal Islander Skills Development Association presents The National Aboriginal and Torres Strait Islander Dance College with KAMU, in Bay 20, Carriageworks, Redfern. 25-28 November. The National Aboriginal and Torres Strait Islander Dance College presented a program of dance works with and from the cohort of students working in Certificate II, III, and IV. After Welcome to Country, the first half of the program demonstrated the training of these students in the rudiments and artistry of contemporary dance under the choreography of Penelope Mullen: EXHALE; a self devised work, danced and choreographed by Nadia March and Kassidy Waters: CHANGE; Raymond D Blanco: ADTHABAU APU - a work that is a conversation between the dancers and the Sea; Joel Bray: AUGURY; Ian RT Colless: TO CLOSE A GAP? - a second stage development of a larger work for the future with contemporary political overtones in a desire to pull together different points-of-view with [the] common theme 'TO CLOSE A GAP'. These works revealed - 'showed-off' - the training and rigour of the dance skills absorbed by the young 'artists-in-training' who all come from a wide geographical and basic skill base, and demonstrated the varying qualities of achievement attained through the year(s) of practice. The demands of the choreography were high and the acquittal demonstrated the commitment of each of the artists in the glare of light with sound and audience. - a 'fiery' rites of passage for all, no doubt - and a joyful and fun one, as well, I hope. In the 50,000 year continuum of Australian Aboriginal and Torres Strait Islander knowledge, NAISDA occupies a small but influential contemporary space, both as a safe and fertile place of creative practice, but also a complex and demanding keeping place of traditional cultures. I read Raymond D Blanco's program notes which told us of this year's venture, where and when student-artists were welcomed to the Moa Island by the Traditional Owners of Kubin Village and were accompanied to St Paul's (Wug) Village to commence a cultural residency. That here they were given an opportunity to live with families and gained a deeper insight into community life - including coconut oil making, preparation and cooking for feasting, as well as the continued learning in the art of weaving, beading, fishing, dancing, song and other activities. From this immersion into this welcoming community-culture, a program of original dance was created in exchange with the St Paul's community led by Dujon Niue. The Cultural Dance Tutors, Wug Village, Moa Island: Christal Ware, Angela Torenbeek and Wally Kris. So, the second half of the program presented dances arising from this (and other, I expect) first hand experiences, an invaluable aspect of the training and vision of NAISDA - to preserve by respectful 'reaching out' and sharing, the traditions of culture for all the peoples of today. Berthalia (Selina) Reuben using the Female Ensemble choreographed: GUR IRA KOSKIR (WOMEN OF THE SEA) - telling of the relationship that females have with the sea, tide and ocean breeze, of the time of birth and new beginnings. This Ensemble also gave us SUBMERGE. Sani Towson, using the Male Ensemble Choreographed: THAGANU GATH AIMIZ - telling of the gathering of young boys at low tide in the mangroves observing the abundance of sea life and the blooming of Kamu - KAMU, is the Kala Lagaw Ya word meaning Mangrove Flower. The final section of the performance was made up of DANCES FROM WUG VILLAGE, MOA ISLAND, choreographed by Dujon Niue: WOMEN'S PADDLE DANCE; MEN'S PADDLE DANCE; SIK DANCE; KAMU DANCE. Dressed in 'traditional' Indigenous costume and with decorated 'instruments' of dance, the company, thrillingly, in the concentrated possession of the 'spirit' of the island culture, sang and danced with a sense of rising excitement and ownership, accompanied by a live guest 'orchestra' of singers and drummers, so that they all seemed to glow with the pleasure of the audience's rapture and applause at its conclusion. The whole program of KAMU, Directed by Frances Rings, delivered the stated vision of Mr Mundine and no more satisfyingly that in the second half of KAMU. Next year is the 40th year of NAISDA and celebratory works will be presented at Carriageworks in 2016. In the meantime, this week, Bangarra Dance Theatre presents OCHRES, at Carriageworks, a revival of a work from 1994. Go see the 'fruits' of this visionary cultural icon, NAISDA.